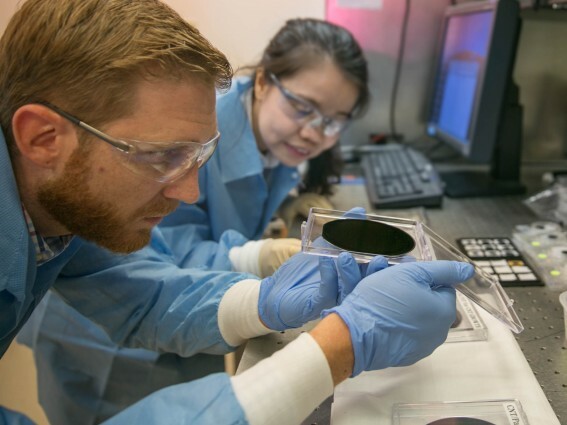 Researchers Eric Meshot, left, and Ngoc Bui evaluate the uniformity of a carbon nanotube array covering the entire area of a 4-inch wafer. Photos by Julie Rusell/LLNL. This material is the first key component of futuristic smart uniforms that also will respond to and protect from environmental chemical hazards. The research appears in the July 27 edition of the journal, Advanced Materials. High breathability is a critical requirement for protective clothing to prevent heat-stress and exhaustion when military personnel are engaged in missions in contaminated environments. Current protective military uniforms are based on heavyweight full-barrier protection or permeable adsorptive protective garments that cannot meet the critical demand of simultaneous high comfort and protection, and provide a passive rather than active response to an environmental threat. The LLNL team fabricated flexible polymeric membranes with aligned carbon nanotube (CNT) channels as moisture conductive pores. The size of these pores (less than 5 nanometers, nm) is 5,000 times smaller than the width of a human hair. "We demonstrated that these membranes provide rates of water vapor transport that surpass those of commercial breathable fabrics like GoreTex, even though the CNT pores are only a few nanometers wide," said Ngoc Bui, the lead author of the paper. To provide high breathability, the new composite material takes advantage of the unique transport properties of carbon nanotube pores. By quantifying the membrane permeability to water vapor, the team found for the first time that, when a concentration gradient is used as a driving force, CNT nanochannels can sustain gas-transport rates exceeding that of a well-known diffusion theory by more than one order of magnitude. These membranes also provide protection from biological agents due to their very small pore size -- less than 5 nanometers (nm) wide. Biological threats like bacteria or viruses are much larger and typically more than 10-nm in size. Performed tests demonstrated that the CNT membranes repelled Dengue virus from aqueous solutions during filtration tests. This confirms that LLNL-developed CNT membranes provide effective protection from biological threats by size exclusion rather than by merely preventing wetting. Furthermore, the results show that CNT pores combine high breathability and bio-protection in a single functional material. However, chemical agents are much smaller in size and require the membrane pores to be able to react to block the threat. To encode the membrane with a smart and dynamic response to small chemical hazards, LLNL scientists and collaborators are surface modifying these prototype carbon nanotube membranes with chemical-threat-responsive functional groups. These functional groups will sense and block the threat like gatekeepers on the pore entrance. A second response scheme also is in development -- similar to how living skin peels off when challenged with dangerous external factors. The fabric will exfoliate upon reaction with the chemical agent. "The material will be like a smart second skin that responds to the environment," said Kuang Jen Wu, leader of LLNL's Biosecurity & Biosciences Group. "In this way, the fabric will be able to block chemical agents such as sulfur mustard (blister agent), GD and VX nerve agents, toxins such as staphylococcal enterotoxin and biological spores such as anthrax." Current work is directed toward designing this multifunctional material to undergo a rapid transition from the breathable state to the protective state. "These responsive membranes are expected to be particularly effective in mitigating a physiological burden because a less breathable but protective state can be actuated locally and only when needed," said Francesco Fornasiero, LLNL's principal investigator of the project. The new uniforms could be deployed in the field in less than 10 years. "The goal of this science and technology program is to develop a focused, innovative technological solution for future chemical biological defense protective clothing," said Tracee Whitfield, the DTRA science and technology manager for the Dynamic Multifunctional Material for a Second Skin Program. "Swatch-level evaluations will occur in early 2018 to demonstrate the concept of 'second skin,' a major milestone that is a key step in the maturation of this technology." The work is funded by the Chemical and Biological Technologies Department of the Defense Threat Reduction Agency (DTRA) in the "Dynamic Multifunctional Materials for a Second Skin D[MS]2" program, and by the Laboratory Directed Research and Development (LDRD) program. Other researchers contributing to this work include Eric Meshot, Jose Pena, Sangil Kim and Phillip Gibson (Natick Soldier Research Development and Engineering Center).